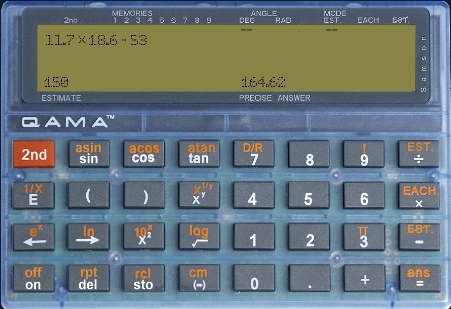 The QAMA calculator should not be seen as an aid for occasional estimation practice sessions: Students should each have their own QAMA calculator so that they use it routinely and exclusively - every time they perform a calculation: in the math classes, science classes and labs, and also at home: It should become second nature to always engage their head when performing calculations. This way they would always know the meaning of the functions which they are using, always have an understanding of the operations they are performing, always have a quantitative comprehension of the calculations, and altogether get into the habit of accepting only things they understand. Inevitably, this will then fundamentally change their performance level, and more importantly- the usefulness of their work altogether.